The General Assembly declared by Act No. 360, 1984, the peach, (Prunus persica,) as the official fruit of the State. 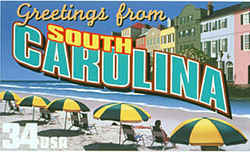 South Carolina is the nation's leading peach producer and shipper east of the Mississippi River. South Carolina grows over thirty varieties of peaches and ranks second in fresh peach production in the United States behind California. 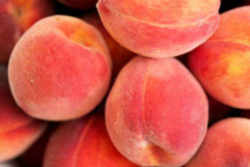 Peaches were cultivated in China before written history, and moved to Persia (Iraq) along silk trading routes. The epithet persica denotes Persia, which is where Europeans first obtained peaches. Greeks and especially Romans spread the peach throughout Europe and England starting in 300-400 BC. Peaches came to the new world with explorers of the 16th-17th centuries, with Portuguese introducing it to S. America and Spaniards to N. America (Northern Florida/Georgia coast). Native Americans and settlers distributed the peach across N. America into southern Canada, and it is cultivated in 2/3 of the 48 contiguous states today. 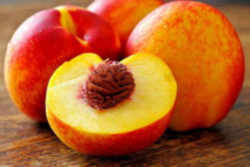 The peach falls into the Prunoideae subfamily of the Rosaceae, often referred to collectively as "stone fruits". The subgenus Amygdalus contains the commercially important peach and almond. 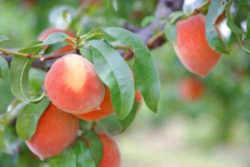 In addition, there are four other species closely related to peach: P. davidiana, P. kansuensis, P. ferganensis, and P. mira. 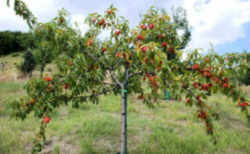 The former two species have small fruit resembling peach, but poor eating quality and are used only as rootstocks. 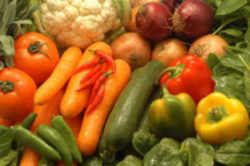 P. ferganensis offers the best fruit quality of the four, and is cultivated in the Fergana Valley region of the south central (former) USSR, and in western China. P. mira is a shrub form native to southern Tibet, Nepal, and northern India, where it is infrequently cultivated for its fruit. There are thousands of peach cultivars worldwide, and far more are cultivated in economic quantities than for apple or pear. One reason for this is the ease with which peaches are bred (unlike apple and pear cultivars which are mostly the result of chance selection, not breeding). A small tree with a spreading canopy, usually 2-3.5 m in cultivation. 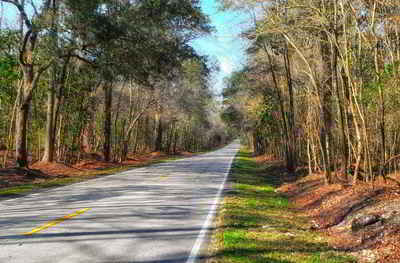 Trees are short-lived, generally living only 15-20 years, and even less in cultivation (e.g., the average tree life expectancy in Georgia is 8 years). Leaf: Alternate, simple, lanceolate, serrated, 3 to 6 inches long, often curved along midrib, shiny dark green above, paler below. Flower: Light pink to carmine, to purplish; 1 inch in diameter. Single locule, single seed inside superior ovary, surrounded by hypanthium. Color of inner surface of hypanthium is indicative of flesh color; whitish-green = white, gold = yellow. Petals can be large and showy, or small and curved on margins. Flowers are borne singly on short peduncles (almost sessile), from lateral buds on 1-yr-old wood; usually 1-2 flower buds/node. Ornamental peaches contain fully double flowers, having many petals and a carnation-like appearance. Colors range from dark pink to white. 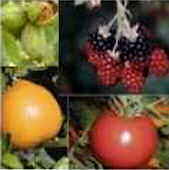 Fruit: Fuzzy drupe, 3 inches across, yellow and red, hard, ribbed pit inside encloses the seed, very delicious and juicy, ripens in mid summer. Twig: New growth is red and green, later turns gray brown, buds are blunt and gray fuzzy, spur shoot present. Bark: Dark gray, initially smooth with elongated lenticels, later splits and becomes irregularly scaly. Form: A small tree up to 15 feet with a spreading crown. The law designating the peach as the official South Carolina state fruit is found in the South Carolina Code of Laws, Title 1, Chapter 1, Article 9, Section 1-1-680. SECTION 1-1-680. Official State fruit. The peach is the official fruit of the State.